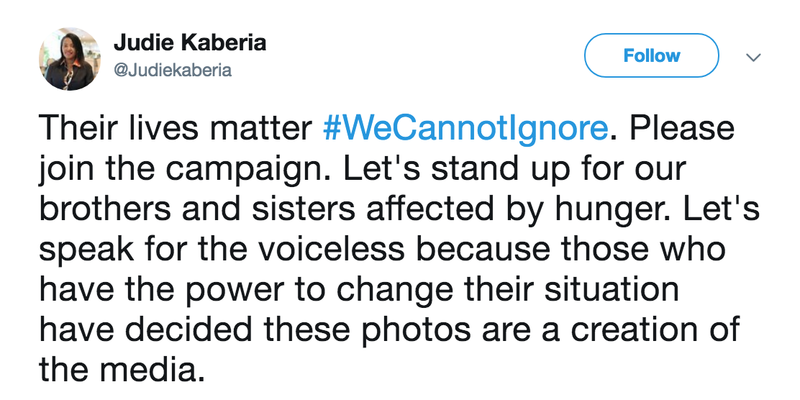 The hashtag #WeCannotIgnore is trending on Twitter in the country with users sharing pictures of people suffering the effects of hunger in Turkana. They’re calling upon the government to help those impacted by drought in the area but officials insist there is no food emergency in Turkana. “When I look at my paycheck and see how much the government takes away from me; and millions others … there is more than enough to feed famine stricken Kenyans,” sports presenter Carol Radull posted on Twitter. “Stop wasting time and use my taxes properly!” she added. Journalist Judie Kaberia also took to Twitter, calling for people to join a campaign to get help to those suffering in Turkana, insisting “their lives matter”. In another Tweet, she expressed demands for accountability over a lack of government action. The government acknowledges more than 1.1 million people are facing food shortages but describes the figure as “normal”. Authorities have also said the deaths in Turkana haven’t been directly attributed to drought conditions in the area. According to the BBC, James Oduor from the Drought Management Authorities told the broadcaster’s news agency that there’s nothing unusual about one million people facing starvation. He told the BBC’s Newsday programme that the situation in Turkana is not currently an emergency and said people in the area are facing food shortages because they are poor.